The Centre for Academic Development and Quality (CADQ) and The Trent Institute for Learning and Teaching (TILT) hosted a one-day Expert Class on the SCALE-UP approach. 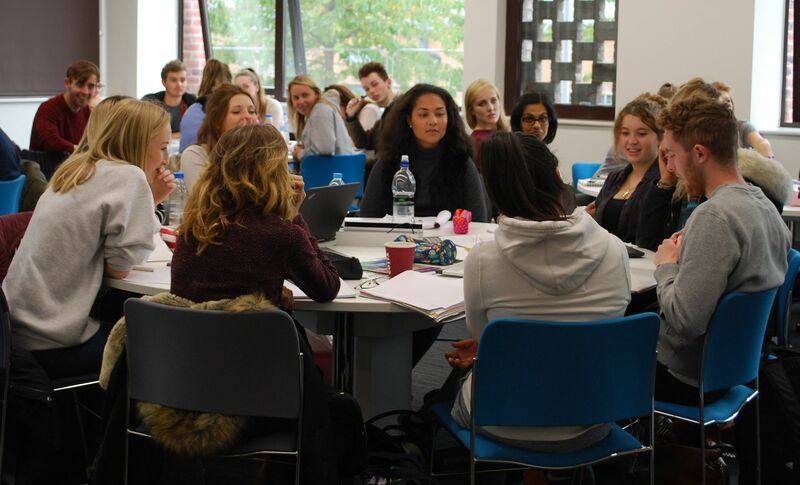 Nottingham Trent University (NTU) is a UK leader in the use of the SCALE-UP approach (Student-Centred Active Learning Environment with Upside-down Pedagogies). SCALE-UP combines an active mode of learning with a bespoke, technology-rich environment. Lectures are replaced by collaborative problem-solving activities carried out in strategically-assigned groups. The specially designed learning environment incorporates circular tables, shared network laptops, whiteboards, and large screens to which student work can be projected and shared. This is supported by an upside-down or flipped pedagogy, where content is encountered outside class, and sessions are devoted to ‘public thinking’ and the application of knowledge. NTU was the first HE institution in the UK to introduce SCALE-UP (originating in Physics) across multiple disciplines and we now have over 200 academics delivering through the SCALE-UP approach. Our SCALE-UP expertise was recognised when, in 2017, we won one of 17 national collaborative projects in the HEFCE Catalyst programme: Addressing barriers to student success. Our project, led by Jane McNeil, Director of Academic Development, is exploring institutional barriers to widespread adoption and the extent to which the benefits of this form of enquiry-based learning can reduce disparities in progression and attainment at scale. The project will run until February 2019. This special event involved colleagues from across the institution sharing what we have learnt so far. The event was particularly suited to colleagues looking to integrate active, collaborative learning practices, specifically academics, course leaders and those with responsibility for implementing pedagogical and learning space innovation. SCALE-UP in the disciplines – set 1. SCALE-UP in the disciplines – set 2. For more information on SCALE-UP at NTU, visit our web pages. We are delighted to invite you to contribute to the 2019 TILT Festival of Learning.